Time for more blurbs. I’m a hoarder when it comes to one thing: the written word. I’ve got stacks of interesting articles and newspaper clippings everywhere. I used to file them away, but I don’t have the patience for that type of organization anymore. I’ll just blog about them, then toss. 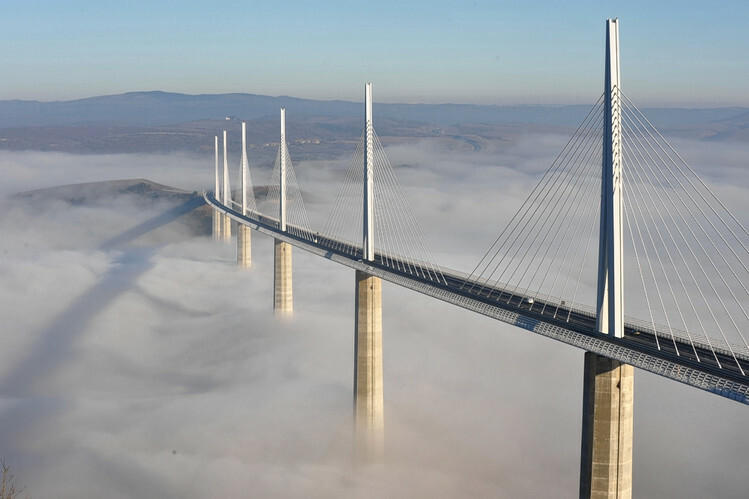 How beautiful is this bridge in France? It’s one of the tallest in the world. Read about the Photo-Op here. So what’s your point? Am I supposed to set the alarm at 6am and pretend I hear a crying baby just for the hell of it? Some people are so dumb. I think sleeping in until 10am or 11am on the weekends is one of the most coveted luxuries of life. Here’s some info from the WSJ about catching up on lost sleep. Getting eight hours of shut-eye each night is generally recommended, but many people don’t. As the week rolls from Monday to Friday, they accumulate a sleep debt. Spending a few extra hours in bed on a Saturday morning, people assume, will help them “catch up” on lost sleep. They’re likely right. “Nobody knows how long the horizon is, probably a few nights, but studies show that recovery sleep in the short term does work,” says Dr. Winter, a member of the American Academy of Sleep Medicine. Here is an interesting article on the perplexing question as to why Girl Scout cookies are not tax deductible. If the IRS rules say you cannot deduct anything from which you receive a personal benefit, then why are we taking tax deductions on all other non-profits since we usually receive some kind of benefit from them. I donate to my church and I receive a personal benefit from attending mass, right? Ooh I hate sleeping in (and I don’t have children, well if you call a dog children then I have one) I love to get up early in the morning and go for a run on the beach its the best time. Although I must say I have changed my habits as I get older, in my teens and twenties I could sleep my life away. I wish I could say I hate sleeping in. I would be so much more productive if that were the case.